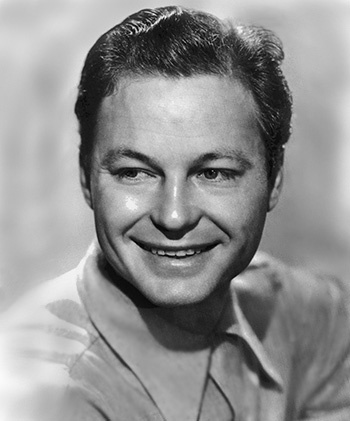 DeForest Kelley was born on January 20, 1920, in Atlanta, Georgia. After working as an actor in Hollywood, he enlisted in the U.S. Army Air Forces on March 3, 1943, and went on active duty beginning March 10, 1943. PFC Kelley served stateside during World War II making training films for the military before receiving an honorable discharge from the Army Air Forces on January 28, 1946. After leaving the military he returned to acting where he starred in many motion picture and television shows, the most famous of which was as Dr. Leonard McCoy in the Star Trek television show and movies. DeForest Kelley and his wife Carolyn Dowling were married from September 7, 1945, until his death on June 11, 1999. His body was cremated and his ashes were scattered in the Pacific Ocean.